Firing up the grill is a summer tradition. The weather gets warmer and stepping outside is a treat, instead of a dreaded task. Standing in the light of the setting sun waiting to flip your dinner over as it embraces the flames of the charcoal. Each flame brings a instant reminder of summertime to your plate with charcoal marks on your food and the fate smell of smoke in the air. Your only goal is to find as many grill inspired recipes as possible. Everything from chicken to steak to vegetables tastes better grilled. 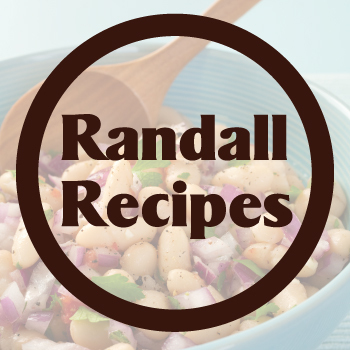 Let Randall Beans add another recipe to your grilling repertoire. Our Grilled Chicken and Veggie Bean Salad brings a new taste dimension to your plate. The grilled chicken blends smoky notes with an interesting vegetable mélange. Lettuce, cherry tomatoes, and onions contribute to a classic fresh salad recipe. While corn and avocados create a south-of-the-border flair to the dish. Garnish with cilantro and parsley for added flavor and a complete summertime meal. For a really special taste treat, add some hickory or other wood chips to the grill to lend a smoky flavor to the chicken. Brush the chicken with olive oil and season with salt and freshly ground pepper. Grill on a hot grill for about 10 minutes, turning once (cooking tip: grilled chicken breasts and steaks taste better and are more succulent and juicy if turned only once). Remove, cool and slice across the grain into 1/4" strips. Toss together the corn, beans, onions, avocados and cilantro. Stir together the dressing ingredients with a whisk until smooth. Toss the dressing in with the vegetable mixture. Line a plate with the lettuce and arrange the vegetable mixture on the lettuce; top with the chicken. Garnish with some parsley sprigs and halved cherry tomatoes.